The term hallux varus describes a clinical condition of the foot characterized by medial deviation of the great toe relative to the first metatarsal ray. Hallux varus has variable degrees of severity, symptomatology, and etiology. Causes range from the most common iatrogenic postoperative variety  to idiopathic, rheumatic, and posttraumatic (tear of the hallux lateral collateral ligament) forms. Fossilized evidence of modern humans in Africa from 3 million years ago reveals footprints that show hallux varus. Other imprints uncovered in northern Japan are dated to 2300 BC and also show varus alignment of the great toe. The later impact of shoe wear had a definite influence on alignment of the hallux. Flexible hallux varus is a common finding in newborns and is a reflection of intrauterine positioning. It usually corrects to valgus in early childhood when walking begins. [2, 3] On the other hand, the normal 0-20º deviation that is seen in hallux valgus occurs after walking has begun in the child and after shoes have been introduced to the child's feet. Cadaveric biomechanical studies have revealed that the anatomic restraints to hallux varus, in descending order, are the lateral capsule, the adductor hallucis, and the lateral flexor brevis tendon. Congenital hallux varus may be divided into primary and secondary pathologic deformities. Primary hallux varus is a rare condition that is usually related to an overactive abductor hallucis. Secondary hallux varus is related to other congenital abnormalities, such as metatarsus adductus, great toe polydactyly, longitudinal epiphyseal bracket syndrome, and delta phalanx. Primary dynamic infantile hallux varus is caused by medial insertion of the abductor tendon. Acquired adult hallux varus is described in inflammatory arthropathies, including rheumatoid and psoriatic arthritis. The mechanism of such arthropathies combines destruction of the articular surfaces by pannus, intrinsic muscular contracture, and distention of the joint capsule with subsequent laxity of the collateral ligaments. Few reports exist of traumatic hallux varus following sports injuries. In the cases that have been reported, hallux varus occurred secondary to rupture of the lateral collateral ligament and conjoined tendon. Spontaneous idiopathic hallux varus may be noted incidentally and is usually supple (see the images below). An etiologic factor is not always demonstrable. Clinical photo of idiopathic hallux varus of left foot. 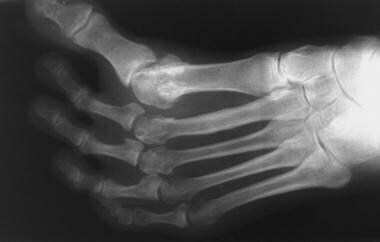 Anteroposterior radiograph of foot depicts idiopathic hallux varus. Lateral radiograph of foot shows idiopathic hallux varus. The initial deforming force is likely overpull of the abductor tendon, which is related to medial insertion into the proximal phalanx; this may be influenced by an inflammatory process or by minor trauma. The imbalance leads to varus deformity and subsequent contracture of the medial capsule, decrease of the intermetatarsal (IM) angle, and medial subluxation of the flexor and extensor mechanisms. Shoe wear tends to correct the varus deformity rather than exacerbate it, as it does for hallux valgus. Therefore, spontaneous idiopathic hallux varus may be more common than is reported. 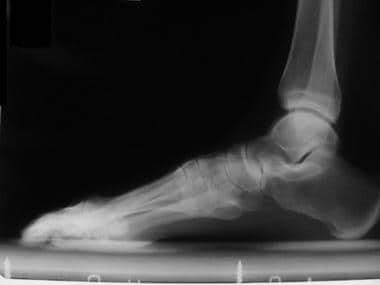 Anteroposterior radiograph of foot shows iatrogenic hallux varus following proximal osteotomy and distal soft-tissue realignment. Lateral radiograph of foot depicts iatrogenic hallux varus following proximal osteotomy and distal soft-tissue realignment. This posture results from muscle imbalance that is brought about by the medial subluxation of the tibial sesamoid. Release or transfer of the adductor hallucis alone is not sufficient to produce dynamic hallux varus; however, when coupled with excision of the fibular sesamoid or transection of the lateral head of the flexor brevis tendon, hallux varus likely results. Other predisposing factors for hallux varus are a small IM angle and a round metatarsal head. Flexion of the MTP joint is brought about by the flexor hallucis brevis through its pull on the sesamoid sling. If the fibular sesamoid is excised, the metatarsal may buttonhole through the defect and result in hyperextension and medial deviation of the MTP joint. Medial deviation is exacerbated when the adductor tendon is detached and nothing opposes the pull of the abductor hallucis. Potential contributing factors include overplication of the medial capsular structures, medial displacement of the tibial sesamoid, overpull of the abductor hallucis against an incompetent lateral ligamentous complex, excessive resection of the medial eminence, and overcorrection with a postoperative dressing that holds the MTP joint in a varus position. Another cause of hallux varus is overcorrection of a proximal first metatarsal osteotomy, leading to a negative IM angle. The incidence of iatrogenic postoperative hallux varus ranges from 0% for distal osteotomies without a lateral release to 15% for proximal osteotomies (specifically, the Lapidus procedure) with distal soft-tissue release. [9, 10] Most reports are of crescentic osteotomies, which have an overall varus rate of 10%. The incidence of idiopathic, congenital/infantile, traumatic, and otherwise acquired hallux varus, however, is unknown. Feinstein MH, Brown HN. Hallux adductus as a surgical complication. J Foot Surg. 1980 Winter. 19 (4):207-11. [Medline]. Jahss MH. Disorders of the hallux and first ray. Disorders of the Foot and Ankle: Medical and Surgical Management. 2nd ed. Philadelphia, Pa: WB Saunders Co; 1991. 1084-9. Miller JW. Acquired hallux varus: a preventable and correctable disorder. J Bone Joint Surg Am. 1975 Mar. 57(2):183-8. [Medline]. [Full Text]. Janis LR, Donick II. The etiology of hallux varus: A review. J Am Podiatry Assoc. 1975 Mar. 65 (3):233-7. [Medline]. Granberry WM, Hickey CH. Idiopathic adult hallux varus. Foot Ankle Int. 1994 Apr. 15(4):197-205. [Medline]. Orzechowski W, Dragan S, Romaszkiewicz P, Krawczyk A, Kulej M, Morasiewicz L. Evaluation of follow-up results of McBride operative treatment for hallux valgus deformity. Ortop Traumatol Rehabil. 2008 May-Jun. 10(3):261-73. [Medline]. Popelka S, Vavrík P, Hromádka R, Sosna A. [Our results of the Lapidus procedure in patients with hallux valgus deformity]. Acta Chir Orthop Traumatol Cech. 2008 Aug. 75(4):271-6. [Medline]. Lagaay PM, Hamilton GA, Ford LA, Williams ME, Rush SM, Schuberth JM. Rates of revision surgery using Chevron-Austin osteotomy, Lapidus arthrodesis, and closing base wedge osteotomy for correction of hallux valgus deformity. J Foot Ankle Surg. 2008 Jul-Aug. 47(4):267-72. [Medline]. Lee KT, Park YU, Jegal H, Lee TH. Deceptions in hallux valgus: what to look for to limit failures. Foot Ankle Clin. 2014 Sep. 19 (3):361-70. [Medline]. Davies MB, Blundell CM. The treatment of iatrogenic hallux varus. Foot Ankle Clin. 2014 Jun. 19 (2):275-84. [Medline]. Plovanich EJ, Donnenwerth MP, Abicht BP, Borkosky SL, Jacobs PM, Roukis TS. Failure after Soft-tissue Release with Tendon Transfer for Flexible Iatrogenic Hallux Varus: A Systematic Review. J Foot Ankle Surg. 2012 Mar. 51(2):195-7. [Medline]. Vanore JV, Christensen JC, Kravitz SR, et al. Diagnosis and treatment of first metatarsophalangeal joint disorders. Section 3: hallux varus. J Foot Ankle Surg. 2003 May-Jun. 42(3):137-42. [Medline]. Mann RA, Coughlin MJ, eds. Adult hallux valgus. Surgery of the Foot and Ankle. 6th ed. St. Louis, Mo: Mosby, Inc; 1993. 284-92. Shim JS, Lim TK, Koh KH, Lee do K. Surgical treatment of congenital hallux varus. Clin Orthop Surg. 2014 Jun. 6(2):216-22. [Medline]. [Full Text]. Leemrijse T, Hoang B, Maldague P, Docquier PL, Devos Bevernage B. A new surgical procedure for iatrogenic hallux varus: reverse transfer of the abductor hallucis tendon: a report of 7 cases. Acta Orthop Belg. 2008 Apr. 74(2):227-34. [Medline]. Hawkins FB. Acquired hallux varus: cause, prevention and correction. Clin Orthop Relat Res. 1971 May. 76:169-76. [Medline]. Johnson KA, Spiegl PV. Extensor hallucis longus transfer for hallux varus deformity. J Bone Joint Surg Am. 1984 Jun. 66(5):681-6. [Medline]. Skalley TC, Myerson MS. The operative treatment of acquired hallux varus. Clin Orthop Relat Res. 1994 Sep. (306):183-91. [Medline]. Myerson MS, Komenda GA. Results of hallux varus correction using an extensor hallucis brevis tenodesis. Foot Ankle Int. 1996 Jan. 17(1):21-7. [Medline]. Juliano PJ, Myerson MS, Cunningham BW. 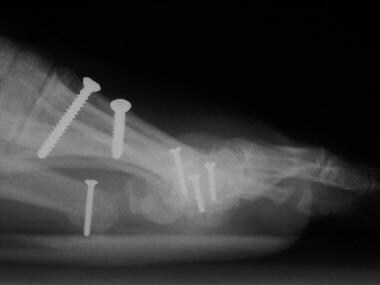 Biomechanical assessment of a new tenodesis for correction of hallux varus. Foot Ankle Int. 1996 Jan. 17(1):17-20. [Medline]. Tourné Y, Saragaglia D, Picard F, et al. Iatrogenic hallux varus surgical procedure: a study of 14 cases. Foot Ankle Int. 1995 Aug. 16(8):457-63. [Medline]. Tanaka Y, Takakura Y, Kumai T, Sugimoto K, Taniguchi A, Hattori K. Proximal spherical metatarsal osteotomy for the foot with severe hallux valgus. Foot Ankle Int. 2008 Oct. 29(10):1025-30. [Medline]. Chow FY, Lui TH, Kwok KW, Chow YY. Plate fixation for crescentic metatarsal osteotomy in the treatment of hallux valgus: an eight-year followup study. Foot Ankle Int. 2008 Jan. 29(1):29-33. [Medline]. Choi KJ, Lee HS, Yoon YS, Park SS, Kim JS, Jeong JJ, et al. 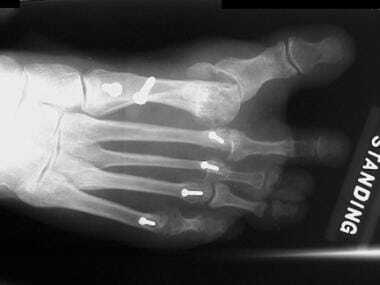 Distal metatarsal osteotomy for hallux varus following surgery for hallux valgus. J Bone Joint Surg Br. 2011 Aug. 93(8):1079-83. [Medline]. Sanders M. Complications of hallux valgus surgery. Complications of Foot and Ankle Surgery. 1998. 1-18. Shibuya N, Jupiter DC, Plemmons BS, Martin L, Thorud JC. Correction of Hallux Valgus Deformity in Association With Underlying Metatarsus Adductus Deformity. Foot Ankle Spec. 2017 Dec. 10 (6):538-542. [Medline]. Shibuya N, Kyprios EM, Panchani PN, Martin LR, Thorud JC, Jupiter DC. Factors Associated With Early Loss of Hallux Valgus Correction. J Foot Ankle Surg. 2018 Mar - Apr. 57 (2):236-240. [Medline]. Drampalos E, Vun SH, Bayam L, Fayyaz I. Early results of an intraosseous device for arthrodesis of the hallux metatarsophalangeal joint. Indian J Orthop. 2017 May-Jun. 51 (3):299-303. [Medline]. [Full Text]. Physical Therapy for Older Adults with Arthritis: What is Recommended?